Word Party – Season 1-2 (2016) – What's New on Netflix Canada Today! 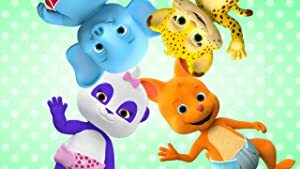 A vocabulary-building show from The Jim Henson Company that follows four adorable baby animals as they sing, dance and play. The show invites young viewers to help teach the baby animals new words, practice these new words themselves, and celebrate these achievements with a “Word Party!” Word Party is produced using Henson Digital Puppetry Studio, a proprietary technology from Jim Henson’s Creature Shop that allows puppeteers to perform digitally animated characters in real time – enabling the animation to be more lifelike and spontaneous. Four adorable animal babies need your help to learn lots of skills – especially how to talk.